Alpha set compatible with Safeguard 511/514 systems for end tab filing. 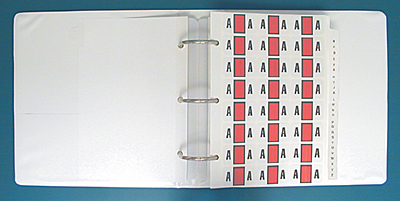 Ringbook (binder) set includes alpha, medical alert and solid color labels plus organizing dividers. Label size: 15/16" x 1 5/8". 3,341 labels per set. Alpha labels are A - Z + Mc: A-red, B-lt. blue, C-lavender, D-lt. green, E-lt. orange, F-dk. green, G-tan, H-dk. blue, I-yellow, J-brown, K-orange, L-gray, M-red/white line, Mc-black/white line, N-lt. blue/white line, O-lavender/white line, P-lt. green/white line, Q-lt. orange/white line, R-dk. green/white line, S-tan/white line, T-dk. blue/white line, U-pink/white line, V-brown/white line, W-orange/white line, X-gray/white line, Y-yellow/white line, Z-lt. purple/white line. Order replacement letters as stock #63-8258. Medical Alert labels: Allergy-neon pink, Medicare-orange, Medicaid-teal. 27 of each. Order replacement labels as stock #63-8259. Solid color labels: red, yellow, dk. blue & dk. green. 27 of each. Order replacement labels as stock #63-8260. Year labels: 54 of each of three years. Order replacement labels as stock #63-7166.